Q. Are there vegetarian products available? A. L’il Critters™ Fruit & Veggie Gummy Bears are vegetarian. Q. What is the source of the coloring used in L'il Critters™ products? Q. Are L'il Critters™ product bottles recyclable? A. L’il Critters™ gummy vitamins should not be exposed to excessive heat or moisture. They should also be kept out of the reach of children. Q: What happens if a child consumes more than the recommended serving size of L’il Critters™? A. A safety assessment is conducted on all of our products to ensure products are safe for human consumption at the recommended dose. You should only consume the amount indicated in the suggested use section on the label. Please consult your medical health care provider or primary care physician for advice. Additionally, please have the product in hand to provide the ingredients, amount of each ingredient, and number of pieces consumed to the physician. Products should be kept out of the reach of children. Q. Can I give Gummy Vites™ to my child who is under 2 years old? A. We recommend that a child be at least two years old, due to choking hazards. Our L’il Critters™ Immune C™ Plus Zinc & Echinacea Gummy Bears are recommended for ages four and older, as Echinacea is not recommended for children under 4. As with any food that is chewy, consumers should always instruct children to chew completely before swallowing. Q. I love L'il Critters™ myself. Do you have anything for adults? A. Yes! vitafusion™ offers a full range of gummy vitamins and supplements which are specially formulated for adults! You can find them in the vitamin aisle at your local grocery store, drug store, club store or mass merchandiser. Q: How much vitamin D should my child get daily? Q. Do you test for mercury in the L’il Critters™ Omega-3 DHA Gummy Fish? A. Yes. L’il Critters™ Omega-3 DHA Gummy Fish contain high quality, purified and concentrated fish oil that is tested for heavy metals (such as mercury and lead). Every L’il Critters™ product contains high quality ingredients. Q. How much calcium is in L'il Critters™ Calcium Gummy Bears? A. A serving of L’il Critters™ Calcium Gummy Bears delivers 200 mg of calcium, as much as a five-ounce glass of milk. Q: Why is there vitamin D in L'il Critters™ Calcium Gummy Bears? A. Lactic acid is a natural preservative and flavor enhancer that is not derived from milk. Q. Are L’il Critters™ Fruit & Veggie Gummy Bears vegetarian? A. Yes. They are made with pectin, which is a vegetarian thickening agent derived from plants and vegetables. Q. Where are L’il Critters™ made? A. All products are made in the USA. Q. Do gummy vitamins have the same benefits as traditional supplements? A. L’il Critters™ gummy vitamins have similar benefits as traditional vitamin tablets with the same nutrient types and amounts. 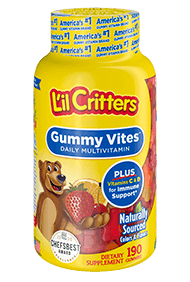 L’il Critters™ gummy vitamins also have a vibrant taste and gummy texture, and are made with natural flavors, which makes taking daily vitamins easier and more enjoyable. L’il Critters™ are a delicious alternative to hard-to-swallow tablets or capsules and are more convenient because there’s no need for water. Q. Are L’il Critters™ products bad for consumers’ teeth due to the gummy consistency? A. We recommend consumers brush their teeth after consuming this product, just like they would for any other food. We recommend consumers consult with their dentist if they have specific concerns. Q. How many calories does each L’il Critters™ product serving have? A. L’il Critters™ products have between 5 and 20 calories per serving. Please check the specific product label for the amount of calories per serving. Q. Are L’il Critters™ approved by the Food and Drug Administration? A. As dietary supplements, L’il Critters™ products are regulated by the FDA. We comply with FDA laws and regulations, including current Good Manufacturing Practices for dietary supplements.